Shetty VP, Rambhia KD, Khopkar US. 18 July 2017, posting date. Descriptive pathology of nerves in leprosy. In Scollard DM, Gillis TP (ed), International textbook of leprosy. www.internationaltextbookofleprosy.org. Leprosy, which is caused by Mycobacterium leprae (M. leprae) (see Chapter 5.1), is primarily a disease of peripheral nerves. It is the only mycobacterial disease affecting the peripheral nerves, which are otherwise highly resistant to bacterial invasion. The target of nerve invasion by M. leprae is the Schwann cell. Man is the natural host of this infection, but a similar illness is found in the nine-banded armadillo . Most of the disabilities and deformities associated with leprosy are the result of nerve damage. The involvement of peripheral nerves was first recorded by Danielssen and Boeck in 1848 . In 1873, Hansen discovered the infectious agent that causes leprosy, M. leprae . In 1882, Virchow suggested that the peripheral nerve might be the primary seat of infection in leprosy . However, it was Fite who categorically stated that “to pathologists all leprosy is neural leprosy” . After studying the histology of early skin lesions, Khanolkar concluded that the cutaneous nerves are the earliest to be involved in all forms of leprosy . 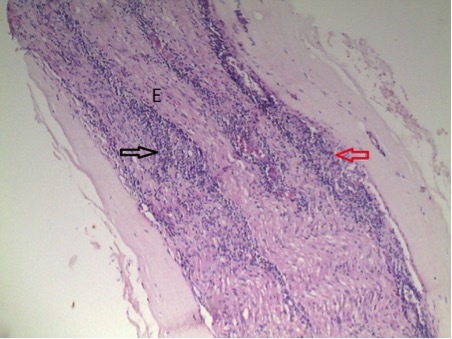 Dehio and Gerlach proposed that the inflammatory response ascended from the cutaneous nerves to the proximal nerve trunks , and the surgical exploration of leprous nerves by Antia et al. further strengthened the idea of disto-proximal spread of M. leprae . 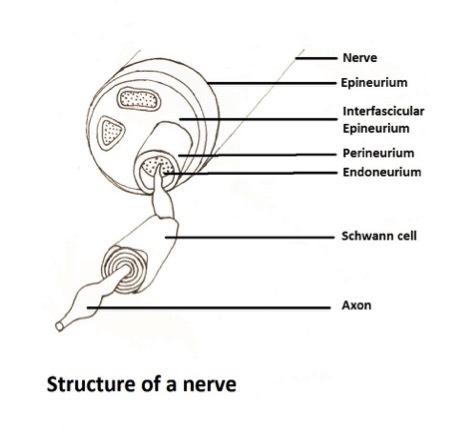 A peripheral nerve is composed of two types of cells: neurons and Schwann cells (Figure 1A). Peripheral nerves are derived from the embryonic ectoderm . A neuron is comprised of a cell body, dendrites, and axons (Figure 1B). The cell body contains the vital organelles necessary for the sustenance of the neuron. Dendrites are short branches from the cell body that are responsible for the transmission of information to the cell body. The axons are long, tubular extensions from the cell body that transmit electrical signals away from the cell body. Multiple axons grouped together form a single nerve fascicle; several nerve fascicles unite to form a peripheral nerve trunk. Schwann cells spiral closely around an axon, producing myelin. The myelin forms a lipid-rich sheath that surrounds and protects the axon, increasing the velocity of transmission of electrical signals along its length. The myelin sheath is interrupted along its length by the Nodes of Ranvier, where the myelin sheath of one Schwann cell ends and another begins. 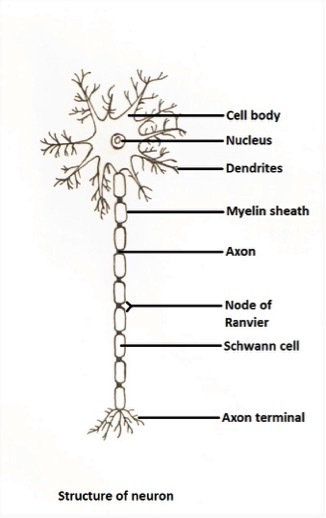 An axon covered with protective myelin and individual Schwann cells constitutes a myelinated nerve. When multiple axons are surrounded and embedded in the invaginations of one Schwann cell, they comprise unmyelinated nerves . In unmyelinated nerves, which are enclosed by only a single or a few layers of Schwann cell plasma membrane, the formation of myelin is absent. It is important to note that the Schwann cells of unmyelinated nerves lack lysosomes, which has been postulated as a reason for the presence and survival of a large number of M. leprae in unmyelinated nerves . A peripheral nerve is composed of multiple nerve fascicles that are made up of axons. Each fascicle is surrounded by a concentric sheath of cells interspersed with collagen fibrils (Type 1 and Type 2) and elastic fibers. This sheath is termed the ‘perineurium’. The innermost layer of the perineurial cells has tight intercellular bridges that maintain the blood-nerve barrier and preserve the endoneurial environment. Multiple nerve fascicles are enclosed within a covering of connective tissue called the ‘epineurium’. The epineurium that covers the entire nerve is called the ‘epifascicular epineurium’, while the layer separating the different fascicles is called the ‘interfascicular epineurium’. The epineurium consists of Type 1 and Type 3 collagen fibrils, fibroblasts, elastic fibers, and mast cells. Vasa nervorum are the blood vessels that comprise arterioles and venules, which carry oxygenated and de-oxygenated blood to and from the nerves. The lymphatic system is present only in the epineurium; there are no lymphatics in the perineurium or the endoneurium. 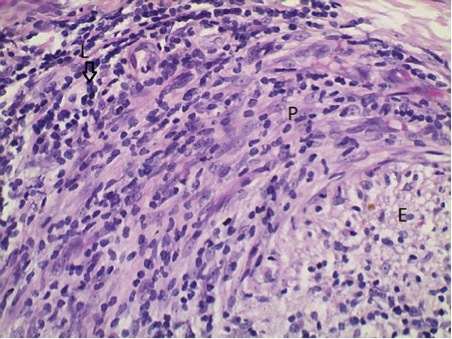 Biopsy of a peripheral nerve is a valuable tool for the diagnosis of leprosy when the clinical examination and the skin biopsy report are inconclusive. A biopsy is of immense value in confirming a diagnosis in cases of pure neural leprosy. A clinically involved nerve must be selected for the biopsy. The ideal nerve is the sural nerve, although a sensory branch of the radial cutaneous nerve can be biopsied. In more than 90% of patients, the sural nerve is largely a sensory nerve; in the remaining 10% of patients, it contains only a few motor fibers . The sural nerve is commonly involved in leprosy and is easily accessible for surgery. Following the biopsy, a formalin-fixed nerve segment is dissected in 2–4 pieces that are arranged transversely and longitudinally in a paraffin block to cut sections of 3–4 mm thickness . If other neuropathies are also likely, a laboratory specializing in peripheral nerve studies should be consulted prior to biopsy. The laboratory can provide instructions that enable additional specialized procedures, such as teased-nerve studies, to be performed. 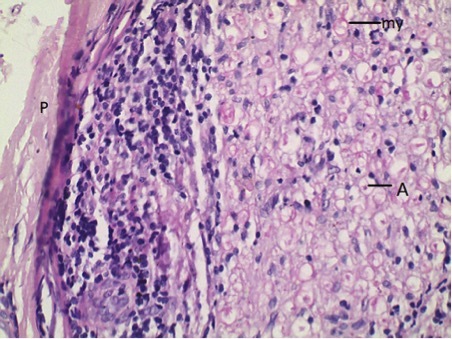 In addition to routine Hematoxylin and Eosin staining and Fite (acid-fast stain) staining, special techniques may be used to visualize or demonstrate the histopathology of the leprosy-affected nerve. Resin-embedded one micron thick (semi-thin) cross and longitudinal sections provide a comprehensive and detailed picture of the relevant structures, including axons and myelin sheaths, with better resolution and morphological accuracy than paraffin sections. Toluidine blue and methylene blue azure II stains should be used, as they provide better contrast. The brown paraphenylene-diamine stain that does not fade easily can also be used. The longitudinal semi-thin sections facilitate analysis of the nodes of Ranvier and of adjacent internodes. Longitudinal semi-thin sections may provide a good, although not perfect, alternative to teased-fiber preparations . Transmission electron microscopy (TEM) of ultrathin sections contrast-enhanced with uranyl acetate and lead citrate help to detect fine structural changes under high resolution. The teased-fiber technique is the most useful method for studying peripheral myelinated nerve fibers in their continuity. It is possible to assess the size of myelin segments and visualize the pathologic changes affecting the internodal regions, the paranodal regions, and the axons using this technique . Fiber teasing is performed on pre-stained, proximo-distally oriented portions of peripheral nerves. It is a useful technique for the examination of nerves in leprosy, as segmental demyelination and early stages of Wallerian or secondary axonal degeneration can be recognized in teased fibers. The histopathological hallmark of tuberculoid leprosy is the presence of epithelioid cell granulomas. It is thought that M. leprae become lodged in the Schwann cells of the nerves, usually at cooler sites, sites of trauma, or superficial sites of nerve entrapment. These bacilli in the parasitized nerves soon start multiplying, although to a limited extent. Subsequently, the bacterial antigens are exposed and recognized by the host immunity, triggering a granulomatous response (see Chapter 9.2). Microscopic examination of the affected nerve in tuberculoid leprosy reveals a well-localized, longitudinal lesion involving one or a few nerve fascicles. The adjacent areas may appear normal. Figures 2A–2D provide images from a case of borderline tuberculoid leprosy. As depicted in the figures, infiltrating cells comprising well-differentiated groups of epithelioid cells and Langhan’s type of giant cells, surrounded by a large number of lymphocytes, are seen both within and around the involved nerve fascicles (Figures 2B, 2C). Destruction of the nerve parenchyma, including the perineurium and the protective barrier, is apparent in the heavily infiltrated fascicles. These changes are seen in leprosy patients with good cell-mediated immune (CMI) responses (see Chapter 6.3). The nerve architecture is disturbed to the extent that some of the fascicles are totally destroyed, whereas others may be only partially involved or may appear to be almost normal (Figure 2A, fascicles A, B, and C). There is a positive correlation between the extent of inflammatory infiltrate and the destruction of collagen matrix and neural tissue. The presence of thick and folded myelin surrounding atrophied axons and an increase in the number of small, thinly myelinated fibers, suggesting regeneration, have been demonstrated in the periphery of the granuloma . 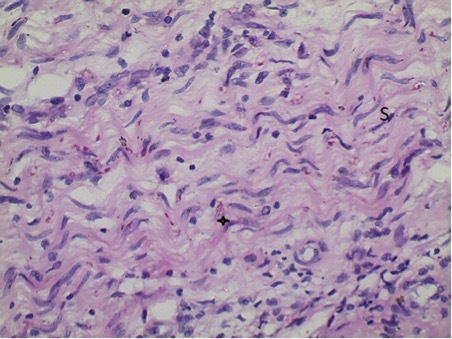 Caseous necrosis is a peculiar feature of granulomatous responses in tuberculoid and borderline tuberculoid neural leprosy . Chandi et al. 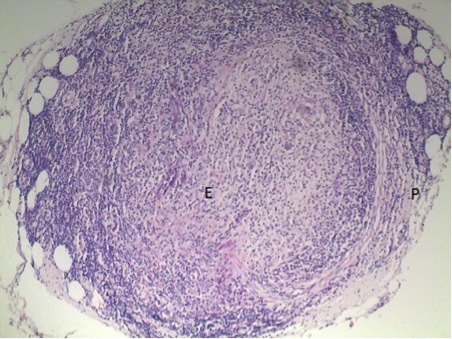 proposed the term ‘segmental necrotizing granulomatous neuritis’ (SNGN) for the histopathological finding of caseous necrosis with epithelioid cell granulomas  (Figures 2A, 2D). A caseous abscess is usually observed in the major nerve trunks, but it may occasionally be seen in cutaneous nerves arising in a patch . Histologically, there is an amorphous eosinophilic caseous mass composed of degenerated nuclei surrounded by epithelioid cells, giant cells, and lymphocytes. The presence of plasma cells, an indicator of the humoral immune response, is also a conspicuous feature of such lesions (Figure 2D). Antia and Mistry have suggested that a critical proportion of antigen, antibody, and CMI could result in the formation of caseous necrosis . Mycobacterial antigens, instead of intact bacilli, are usually found in these lesions and have been detected in TT and BT nerves by Mshana et al. and Barros et al. . Structural changes elicited through studies of semi-thin sections, TEM, and fiber-tease preparations, along with histopathology, have revealed characteristic features in nerves across the leprosy spectrum. Microscopic examination of the affected nerve in tuberculoid leprosy reveals the presence of sub-perineural edema. A few fascicles, or part of a fascicle, may show infiltration with epithelioid cells and lymphocytes. If bacilli are present, they are seen in the Schwann cells of nerve lesions. Fiber density may be markedly reduced in the affected fascicle and may be normal in the uninvolved fascicles . Quantitatively, there is an increase in very small myelinated fibers of less than 3µ in diameter. Groups of fibers with extensive demyelination are seen in close association with aggregates of inflammatory cells, suggesting that localized primary demyelination occurs in areas of active cellular infiltration . Primary demyelination, which occurs in areas of acute infiltration. Secondary demyelination, following axonal atrophy (absent inflammatory infiltrate), affecting nerves away from the inflammatory foci . Infiltration of the perineurium leads to the loss of perineurial cell junctions and basal lamina. 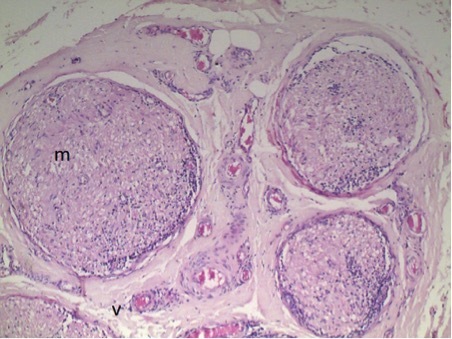 In cases of gross infiltration, identification of the perineurial cells is difficult as they assume a ‘fibroblast-like appearance.’ Multilayering of perineurial cells is not common in TT-BT nerves . In active tuberculoid lesions, there is an increase in vascularity, obliteration of the lumen due to swollen endothelial cells bulging into the lumen, and marked reduplication of the endothelial basement membrane. Mycobacteria are seldom seen in endothelial cells or pericytes in tuberculoid leprosy nerves. Rarely, bacillemia has been reported in the tuberculoid form of leprosy . Nerve lesions in lepromatous leprosy (LL) are characterized by uninhibited multiplication of bacteria, predominantly in the Schwann cells, as a result of a lack of efficient CMI (see Chapters 6.2; Chapter 6.3) against M. leprae. In BL-LL leprosy, there is focal, diffuse involvement of nerves. However, the general architecture of the nerves remains better preserved despite a heavy bacterial presence, in keeping with the very low toxicity of the pathogen and the symbiotic relationship it enjoys with the host. Microscopic features of BL and sub polar lepromatous leprosy (LLs) are depicted in Figures 3A–3G. Histopathological characteristic features of nerve lesions in BL leprosy include a predominance of macrophage infiltrates, a good number of plasma cells, and scanty, mostly dispersed, lymphocytes. The further a lesion is toward the polar lepromatous end of the spectrum, the fewer the lymphocytes. A reduction in nerve fiber density and a proportionate increase in intraneural collagen may be seen. 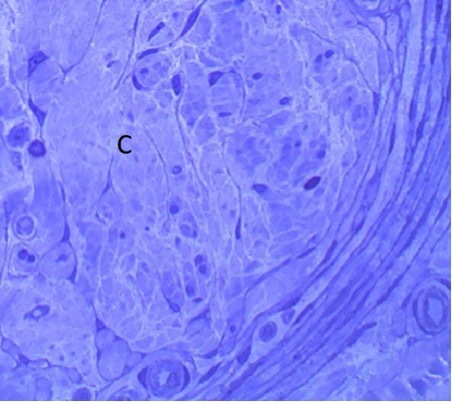 In BL leprosy, there may be variations in the extent of bacillation and infiltration between the fascicles of an involved nerve (Figures 3A, 3B, 3C). The bacillary proliferation occurs primarily in the Schwann cells, but also in the macrophages (such as in the skin, where they are commonly found in the macrophages). The bacilli are arranged parallel to the long axis of the nerve within the Schwann cells (Figure 3G). In the early stages of a lesion, histiocytes and foci of lymphocytic infiltrates may be seen in the peri-vascular areas (Figures 3B, 3F). In chronic or long-standing lesions, they are randomly distributed and macrophages assume foamy cytoplasmic changes (Figures 3D, 3E). 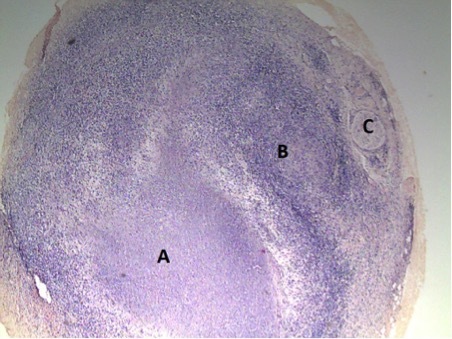 The presence of plasma cells is also a characteristic feature of BL-LL lesions. Occasionally, mast cells are also seen in these nerves. While the presence of histiocytes is a sign of active and recent onset infection, foamy macrophages indicate a chronic or long-standing infection. The perineurial proliferation, or multilayering, is a common feature in lepromatous leprosy (BL-LL) and gives an ‘onion skin appearance.’ In the chronic stage, foamy macrophages are also found in between and around the perineurium (Figure 4A, 4B). Epithelioid cells are never found in the lepromatous pole. The presence of epithelioid cells in resolved lepromatous leprosy indicates an upgrading reaction. Similarly, a nerve abscess is rarely found in lepromatous leprosy . Polar lepromatous leprosy (LL) is characterized by firm, cord-like thickening, which is the result of extensive fibrosis. Histopathologically, there is extensive nerve fiber loss with a concomitant increase in endoneurial collagen. Infiltration with foamy macrophages and an absence of lymphocytes are prominent features. The perineurium may be thick and extensively multilayered. The subperineurial area may contain a granular proteinaceous matrix  and pockets of collagen. Numerous bacilli are seen in the foamy macrophages and Schwann cells are frequently packed in clusters or bundles (Figure 3G). In the absence of any infiltrating cells, it is not uncommon to find Schwann cells loaded with bacilli in a clinically cord-like (fibrotic) nerve from an untreated polar lepromatous (LLp) case. In patients with LL, the nerves may be clinically normal or asymptomatic for a long period of time, even though they may be microscopically involved. In such cases, there is minimal or no cellular infiltrate but a very high bacterial load, especially in the Schwann cells. In addition to the mycobacterial positivity, there may be mild perivascular infiltrate involving the endoneurial and epineurial regions with minimal vascular dilatation. Studies have revealed that in early LL lesions, there is significant reduction in the density of unmyelinated nerve fibers . Although the density of myelinated nerve fibers may be normal or slightly reduced, these fibers show a reduction in the axon caliber and a change in the axon to myelin thickness ratio (g ratio), which suggests axonal atrophy . Hence, early in the evolution of such cases a nerve biopsy is an important method for arriving at the diagnosis. Mid borderline leprosy is an immunologically unstable type of leprosy. It has better CMI than BL, and a higher bacterial load as compared to BT, making this type more prone to acute reactional states. Nerve involvement or damage is more diffuse than in BT and TT lesions. 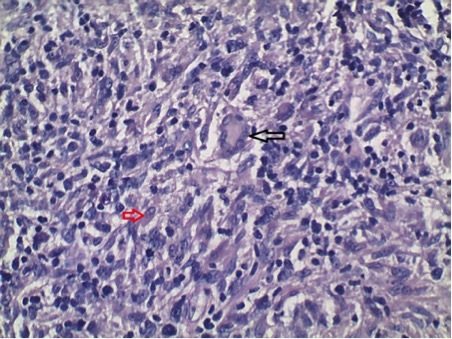 Heavy infiltration of lymphocytes and multinucleated giant cells, if present, suggests a Type 1 reaction, whereas dense aggregates of lymphocytes in the peri-vascular areas suggest an influx of recent origin and an impending Type 1 reaction (Figure 5). Pure neuritic leprosy is not categorized separately in the Ridley-Jopling classification system. This type of leprosy, once exclusive to India , is now found everywhere, although in only a small percentage of patients . 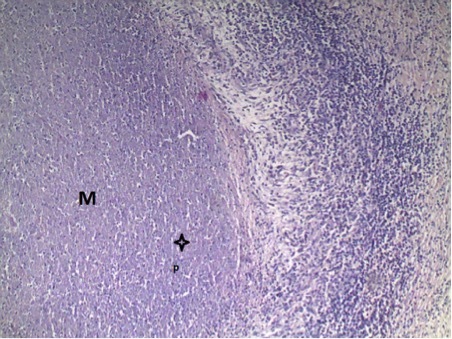 Matrix metalloproteinases (MMPs) and tumor necrosis factor alpha (TNF-alpha) play important and related roles in the pathogenesis of nerve injury in this type of leprosy . A histopathology of pure neural lesions reveals a spectrum ranging from tuberculoid to borderline lepromatous type , . There have been no reports of sub-polar or polar lepromatous leprosy in neuritic leprosy so far. There is evidence of pathological change and the presence of bacilli in the nerves of leprosy patients along the spectrum as well as in familial contacts without any clinical evidence of leprosy . In an early tuberculoid lesion, there is a zone of marked sub-perineurial edema that leads to a net increase in the total fascicular area . This zone comprises proteinaceous granular matrix interspersed with small pockets of collagen. Occasionally, there may be a few abnormalities, such as thinly myelinated nerve fibers, atrophied axons and unusually small myelinated fibers, a loss of fibers, or the presence of unusual fiber complexes. Additionally, a few macrophages and fibroblasts may be found in the endoneurium. These changes reflect the slowly progressive nature of a leprosy infection. The spontaneous regression of early skin lesions is known to occur, especially in the tuberculoid spectrum . Post-treatment, the nerve lesions of leprosy show histological features of healing and repair that are comparable with a regenerating peripheral nerve injury . In addition, telltale evidence of non-specific chronic inflammation comprised of lymphocytes or macrophages, depending on the type of leprosy, persists for years. It is important to note that in a regressing nerve lesion, there is evidence of nerve regeneration and ongoing pathology in the form of inflammation and the presence of M. leprae (dead or alive.) The neural structures may be replaced with collagen. This fibrosis develops slowly, over several years (Figure 6). 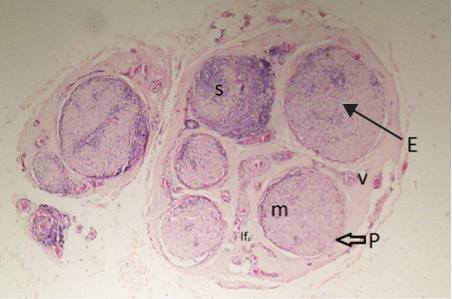 Pyknotic ill-defined cells in between the perineurial cells at the sub-perineurial zone, the perivascular zone, and the endoneurium have been described in nerve biopsies obtained ten years after treatment concluded . These features are helpful in ascertaining and arriving at a differential diagnosis. In regressing BL-LL nerve lesions, large numbers of non-solid acid-fast bacilli may be present in the Schwann cells and foamy macrophages, with a tendency to localize around the blood vessels. The presence of perineurial septa, compartmentalization of the endoneurium (mini fascicle formation), and thickening of the perineurium, with the number of perineurial lamellae increasing to double or quadruple, are fairly common. Axonal atrophy and a large number of regenerating fibers have been found in patients receiving multi-drug therapy (MDT) . Reactions (see Chapter 2.2) in leprosy are periodic episodes of acute inflammation caused by the response of the immune system to the invasion of skin or nervous tissue by M. leprae. Based on the underlying immune mechanisms, the reactions in leprosy are classified as Type 1 or Type 2. These reactions occur frequently in leprosy, and they cause considerable, severe, and, at times, extensive nerve damage. A Type 1 reaction (see Chapter 2.2), also referred to as a reversal reaction, occurs in borderline cases. According to the Coombs and Gell immunologic classification system, it is a type 4 hypersensitivity, or a delayed hypersensitivity type of reaction . A large influx of lymphocytes within and around the nerve, along with extensive edema, is the hallmark feature of nerves in a Type 1 reaction. A total loss of blood, nerve, and perineurial barriers result in a fuzzy and watery appearance to the nerve (Figure 7). Damage to nerve fibers is severe at the sites of reaction, possibly due to the release of large quantities of proteolytic enzymes. A Type 2 reaction (see Chapter 2.2), also known as Erythema Nodosum Leprosum (ENL), occurs in borderline lepromatous (BL) and lepromatous leprosy (LL), where the bacillary load is high. 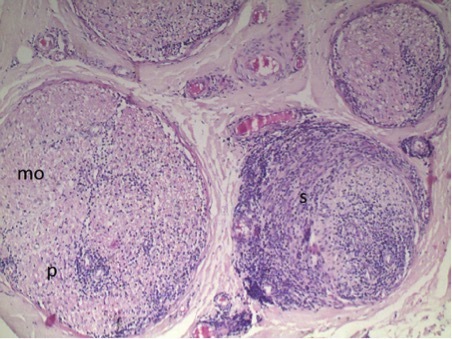 ENL is characterized by edema, an influx of polymorphonuclear infiltrate accompanied by localized areas of breakdown of foamy cells and connective tissue. Eosinophils, mast cells, and vasculitis may also be seen. Occasionally, fibrinoid degeneration in the arteriole along with leucocytoclasia may be seen in the epineurial, perineurial, or endoneurial vasculature. A common site for fibrinoid degeneration is the area where vessels pierce the inner layer of the perineurium. Microscopic or hot abscesses may be formed when the foci of acute inflammatory infiltrate surrounding arteritic lesions coalesce. In the resolution phase, the neutrophils are replaced by lymphocytes and plasma cells, whereas the endoneurial elements are destroyed and fibrosis occurs. Various studies of semi-quantitative analyses of bacterial load in multibacillary nerves have revealed maximum infection in the Schwann cells of non-myelinated fibers (BI = 4 to >6+ in all nerves), followed by macrophages (BI = 2 to 6+ in all nerves), perineurial cells (BI = 2 to 3+ in 80 percent of the nerves), and endothelial cells (BI = 2 to 3+ in 50 percent of the nerves) . The bacterial load in Schwann cells of myelinated fibers formed a very minor component (BI = 1 to 2+ in 20 percent of the nerves), while the presence of bacilli in the axons was rare and could be considered a pathophysiological spillover . Boddingius has postulated that the axons do not play a major role in bacterial dissemination . Silent neuropathy (see Chapter 2.5) is defined as sensory or motor impairment in leprosy without the skin signs of a Type 1 or Type 2 reaction, without evident nerve tenderness, and without spontaneous complaints of nerve pain (burning or shooting pain), paraesthesia, or numbness. The possible mechanisms (see Chapter 9.2) by which nerves are damaged, leading to silent neuropathy, are Schwann cell pathology, nerve fibrosis, a CMI reaction, and an intraneural Type 2 reaction . Neural involvement is the hallmark of leprosy. The histopathology of nerves in leprosy is studied relatively little as compared to its cutaneous counterpart. Nevertheless, leprosy neuropathy is one of the most studied peripheral neuropathies. It is probably the only disorder of the nervous system that has drawn the attention of anatomists, surgeons, pathologists, immunologists, clinicians, and researchers alike, with each making an immense contribution towards understanding its devastating effect. The spectrum of immuno-pathological features that are seen and described in skin lesions are reflected in leprosy-affected nerves. The difference lies in the structure of a nerve. Nerves are equipped with different levels of protective barriers, but lack the lymphatics that guard against an invasion of infiltrating cells, thereby forming an environment that is conducive for bacterial proliferation. The study of the pathology of nerves in leprosy provides an exceptional view of the response when the immune system is ineffective, when it is in a state of balance (no reaction), and when it is in a state of imbalance (reaction). We would like to acknowledge the expertise and efforts of Mr. Ramchandra Chelli in preparing the histopathology slides and CA Nidhi Gulati for helping with the diagrams. ^ Walsh GP, Storrs EE, Burchfield HP, Cottrell EH, Vidrine MF, Binford CH. 1975. Leprosy-like disease occurring naturally in armadillos. J Reticuloendothel Soc 18:347–351. ^ Danielssen DC, Boeck W. 1848. Traite de la spedalskhed ou Elephantiasis des Grecs (LA Cosson, trans). JB Baillière, Paris, France. ^ Hansen GA. 1873. Untersogelser angãende spedalskhedens årsager tiedels ud forte sammen medforstander hartwig. Norske Mag Laegevidensk 4:1. Quoted in Stanford JL, Rook GA, Convit J, Godal T, Kronvall G, Rees RJ, Walsh GP, Preliminary taxonomic studies on the leprosy bacillus. Br J Exp Pathol, 1974, 56:579–585. ^ Virchow R. 1882. Der kiefer aus der schipka-höhle und der kiefer von la naulette. Zeitschrift für Ethnologie, 14:277–310. Quoted in editorial notes. 1952. Lepr India 24:35–46. ^ Fite GL. 1943. Leprosy from histopatholgic point of view. Arch Pathol Lab Med 35:611–644. ^ Khanolkar VR. 1951. 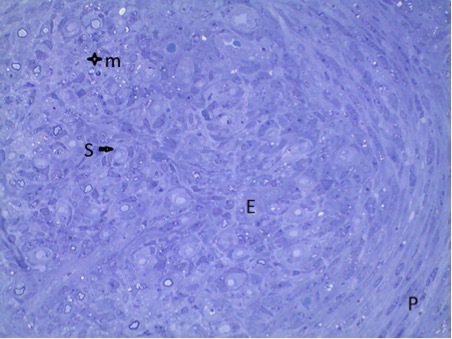 Studies in the histology of early lesions in leprosy, p 1–18. ICMR (Indian Council of Medical Research) Special Report (Series No. 19). ^ Dehio K. 1897, October. On the Lepra Anesthetica and the pathogenetic relation of its disease-appearances. In Proceedings of the International Scientific Leprosy Conference in Berlin. Biswas MG, translator. Translated and reprinted in Lepr India, 1952, 24:78–83. ^ Antia NH, Divekar SC, Dastur DK. 1966. The facial nerve in leprosy. 1. Clinical and operative aspects. Int J Lepr 34:103–117. ^ Ridley DS. 1988. The structure of a peripheral nerve, p 15–19. In Ridley DS, Pathogenesis of leprosy and related diseases. Butterworth-Heinemann, London, England. ^ Breathnach AS. 1977. Electron microscopy of cutaneous nerves and receptors. J Invest Dermatol 69:8–26. ^ Boddingius J. 1981. Mechanisms of nerve damage in leprosy, p 64–73. In Humber DP (ed), Immunobiologic aspects of leprosy, tuberculosis and leishmaniasis. Excerpta Medical, Oxford. ^ Amoiridis G, Schöls L, Ameridis N, Przuntek H. 1997. Motor fibers in the sural nerve of humans. Neurology 49:1725–1728. a, b Weis J, Brandner S, Lammens M, Sommer C, Vallat JM. 2012. Processing of nerve biopsies: a practical guide for neuropathologists. Clin Neuropathol 31:7–23. ^ Krinke GJ, Vidotto N, Weber E. 2000. Teased-fiber technique for peripheral myelinated nerves: methodology and interpretation. Toxicol Pathol 28(1):113–121. ^ Dastur DK, Ramamohan Y, Shah JS. 1972. Ultrastructure of tuberculoid nerves in leprosy. Neurol India 20(Supp 1):89–99. a, b Chandi SM, Chacko CJ, Fritschi EP, Job CK. 1980. 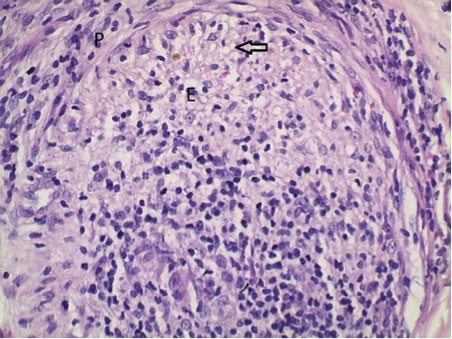 Segmental necrotizing granulomatous neuritis of leprosy. Int J Lepr Other Mycobact Dis 48(1):41–47. a, b Antia NH, Mistry NF. 1985. 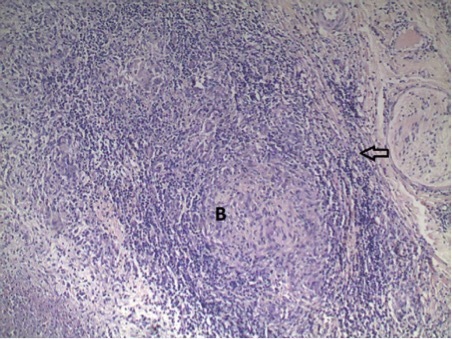 Plasma cells in caseous necrosis of nerves in leprosy. Lepr Rev 56:331–335. ^ Mshana RN, Humber DP, Harboe M, Belehu A. 1983. Demonstration of mycobacterial antigens in nerve biopsies from leprosy patients using peroxidase-antiperoxidase immunoenzyme technique. Clin Immunol Immunopathol 29:359–368. ^ Barros U, Shetty VP, Antia NH. 1987. Demonstration of Mycobacterium leprae antigen in nerves of tuberculoid leprosy. Acta Neuropathol 73:387–392. a, b, c, d, e Antia NH, Shetty VP. 1999. 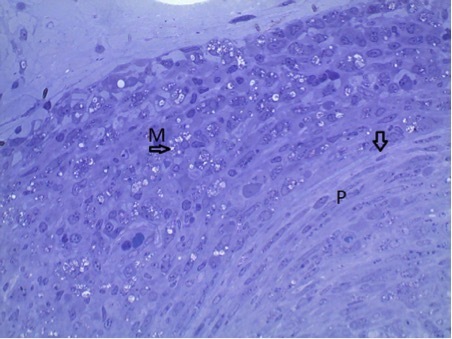 Pathology of nerve damage in leprosy, p 79–137. In Antia NH, Shetty VP (eds), The peripheral nerve in leprosy and other neuropathies. Oxford University Press, Calcutta, India. ^ Shetty VP, Mehta LN, Antia NH, Irani PF. 1977. Teased fibre study of early nerve lesions in leprosy and in contacts, with electrophysiological correlates. J Neurol Neurosurg Psychiatry 40:708–711. ^ Jacobs JM, Shetty VP, Antia NH. 1987. Teased fibre studies in leprous neuropathy. J Neurol Sci 79:301–313. ^ Desikan KV. 1985. Bacteremia in leprosy, chapter 3, p 788–797. In Dharmendra (ed), Leprosy, vol 2. Samant & Company, Bombay, India. ^ Enna CD, Brand PW. 1970. Peripheral nerve abscess in leprosy. Report of three cases encountered in dimorphous and lepromatous leprosy. Lepr Rev 41:175–180. a, b Teles RM, Antunes SL, Jardim MR, Oliveira AL, Nery JA, Sales AM, Sampaio EP, Shubayev V, Samo EN. 2007 Expression of metalloproteinases (MMP-2, MMP-9, and TACE) and TNF-alpha in the nerves of leprosy patients. J Peripher Nerv Syst 12:195–204. ^ Antunes SL, Chimelli L, Jardim MR, Vital RT, Nery JA, Corte-Real S, Hacker MA, Sarno EN. 2012. Histopathological examination of nerve samples from pure neural leprosy patients: obtaining maximum information to improve diagnostic efficiency. Mem Inst Oswaldo Cruz 107:246–253. ^ Noordeen SK. 1972. Epidemiology of (poly) neuritic type of leprosy. Lepr India 44:90–96. ^ Uplekar MW, Antia NH. 1986. Clinical and histopathological observations on pure neuritic leprosy. Indian J Lepr 58:513–521. ^ Kaur G, Girdhar BK, Girdhar A, Malaviya GN, Mukherjee A, Sengupta U, Desikan KV. 1991. A clinical, immunological, and histological study of neuritic leprosy patients. Int J Lepr Other Mycobact Dis 59:385–391. ^ Antia NH. 1974. The significance of nerve involvement in leprosy. Plast Reconstr Surg 54:55–63. ^ Antia NH. 1980. Study of evolution of nerve damage in leprosy—a general introduction. Lepr India 52:3–4. ^ Nolasco JO. 1952. Histologic studies on the primary lesions of leprosy in children of leprous parents; other related studies, including one case with necropsy. J Philipp Med Assoc 28:1–19. ^ Morris JH, Hudson AR, Weddell G. 1972. A study of degeneration and regeneration in the divided rat sciatic nerve based on electron microscopy. IV. Changes in fascicular microtopography, perineurium and endoneurial fibroblasts. Z Zellforch Microsk Anat Histochem 124:165–203. ^ Shetty VP, Suchitra K, Uplekar MW, Antia NH. 1992. Persistence of Mycobacterium leprae in the peripheral nerve as compared to the skin of multidrug-treated leprosy patients. Lepr Rev 63:329–336. ^ Jacobs JM, Shetty VP, Antia NH. 1993. A morphological study of nerve biopsies from cases of multibacillary leprosy given multidrug therapy. Acta Neuropathol 85:533–541. ^ Roitt IM. 1974. Hypersensitivity, p 129. In Essential Immunology, 2nd ed. Oxford: Blackwell Scientific, Oxford. a, b Shetty VP, Antia NH. 1996. A semi quantitative analysis of bacterial load in different cell types in leprous nerves using transmission electron microscope. Indian J Lepr 68:105–109. ^ Boddingius J. 1974. The occurrence of Mycobacterium leprae within axons of peripheral nerves. Acta Neuropathol 27:257–270. ^ van Brakel WH, Khawas IB. 1994. Silent neuropathy in leprosy: an epidemiological description. Lepr Rev 65:350–360.